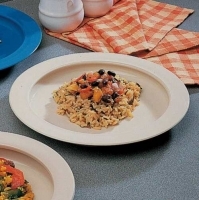 Plate With Inside Edge Make Self Feeding Easier. This high sided plate keeps½food from sliding off the plate to make self feeding easier for children or adults. Dishwasher safe up to 80 degrees centigrade. I have been looking for theseplates for years,, very pleased with my purchase came quickly!